The calculations used in the example code should only be considered when operating at lambda levels near λ 1. Using this approximation outside the intended area of operation will result in a proportional error. 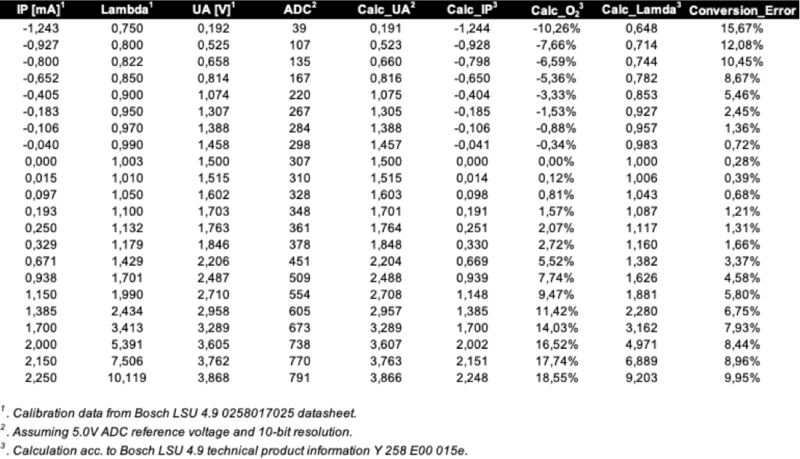 The following table shows the accuracy between λ 0.750 and λ 10.119. The calculation should be used for educational purposes and the accuracy is adequate when operating near λ 1. When measuring at much leaner or richer gases an improved method of converting the CJ125 output voltage is needed. A lookup table have been implemented to the example code to correct this error.